Bond No. 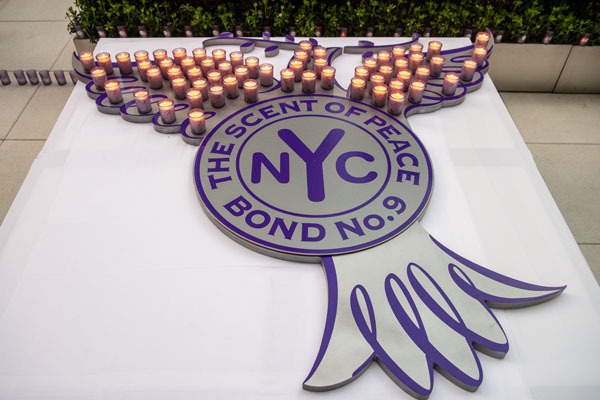 9 New York Perfumerie hosted a Bond Fire at a spectacular event on Tuesday, May 8th to promote international peace and celebrate the brand’s partnership with the UN Women for Peace Association. 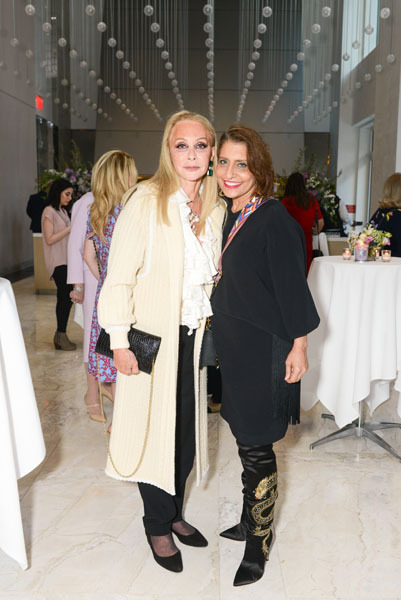 Notable guests included: Laurice Rahmé, Muna Rihani Al-Nassar, Barbara Winston, Michal Grayevsky, Valbona Neritani, Avideh Ghaffari, Susan Gutfreund, Charlene Haroche, Alice Sun, May Zhao, Callie Leone, Leesa Rowland, Victor Roquette, Rachel Alonso-Mendoza, and Laura Day Webb who gathered to #BONDFOR PEACE. Held in the private restaurant at 432 Park Avenue, overseen by Michelin-Starred Chef Shaun Hergatt, Laurice Rahmé, Bond No. 9 Founder and CEO, Dame Muna Rihani Al-Nasser, Chairman and members of the Board of the UN Women for Peace Association and UN Ambassadors and Dignitaries lit 100 Bond No. 9 Scent of Peace Candles on the venue’s 5000 square foot terrace overlooking 57th Street to promote tolerance, respect and the creation of a peaceful world. Intended for men and women alike, The Scent of Peace (arguably the most beautifully civic-minded fragrance ever devised) starts off with sparkling, energizing grapefruit and black current notes, that soon are balanced by the sheer loveliness of lily of the valley, and by those mellowing base notes, cedarwood and musk. The flacon displays a dove in graceful flight. We see this emissary of peace soaring through our city, across the country, across the seas, bringing its message to the world. Bond No. 9 is proud to partner with The UN Women For Peace Association. For every Scent of Peace candle sold leading up to Mother’s Day, Bond No. 9 will donate 1% of sales to further the organization’s mission and promote international peace for women, girls and for all. “As a brand our mission is not just to make new products, but do something bigger,” Laurice Rahmé, Founder and CEO, Bond No. 9 said. UN Women for Peace Association, founded in 2008 under the patronage of H.E. Mrs. Ban Soon-taek, raises awareness of these terrible crimes. UNWFPA promotes and advances the goals of UN agencies who provide opportunities for women through social, cultural, educational, and empowerment programs under the banner of a global peace building process. Proceeds go directly to the UN Trust Fund to End Violence Against Women, which aims to prevent violence against women and girls, provides services and programs to those affected by violence, and strengthens the implementation of laws and policies on such violence. UNWFPA Project: The UNWFPA school for Syrian refugee girls is an educational and vocational school for 160 students who face serious challenges in their daily lives such as the need for healthcare, safe water, adequate sanitation, proper hygiene, and substantial shelter (most live in nearby informal tented settlements). The UNWFPA School for Syrian refugee girls is nonreligious and apolitical. It will teach the official Lebanese curriculum which includes science, mathematics, Arabic and English. The students will also learn vocational and skills training in nurse’s aide, computer literacy, sewing and embroidery, hairdressing and cosmetics. They will receive important child and women protection programs that strengthen their resilience against various kinds of exploitation and increase their opportunities to find jobs and avoid early marriages. Upon graduation students will receive a certificate of accreditation from the Lebanese ministry of education and higher education.